6591 KILOMETERS TO MUMBAI ! Hailing from Kerala, a state in India which is blessed with scenic charms - a natural green carpet all over, along with mountains, perennial streams and lakes, honestly it is difficult for me to appreciate natural scenes elsewhere. Probably from birth we have been growing enjoying these unique scenes , a high standard is already set in unknowingly. But as the natural scenes of Black Forest High lands emerged to my eyes, it was a visual treat for eyes and mind! 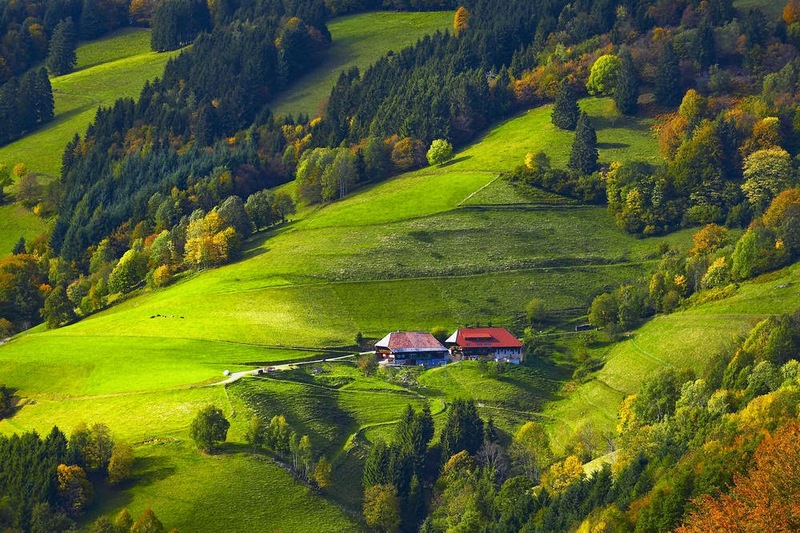 Black Forest Highlands of Germany (Schwarzwald) is home for three bests in the world - breathtaking scenic landscapes, cuckoo clocks and could be the most popular of all- Black Forest cakes! The pines,conifers and fir trees which are grown thickly block out natural light in this forested area to a larger extent creating a dark green effect and the name is derived from that. My recent trip to this area that borders Germany, Switzerland and France was predictably enjoyable which included a visit to a cuckoo clock live demonstration unit. Cuckoo, the medium sized bird in different colours is everywhere in the world mostly in the countryside and forests. It was rare in Kochi, my home town during my childhood but was available in plenty at Irinjalakuda, my mother's place about 50 kms away. I still remember the distinctive call of this bird as we venture out to the farm land adjoining the ancestral house. The bird also is known as Koel in Hindi and Kuyil in my mother tongue. Idea of implanting a cuckoo's call in a clock need not necessarily be from Black Forest area but the credit of manufacturing such clock for the first time definitely goes to them.Since 17th century they are in that industry, often taken as symbolic representation of German craftsmanship itself! Now mostly the Chinese cheap versions are available aplenty is different matter. However the old charm of original cuckoo clocks continues to be conquered. My first hand experience with a cuckoo clock was in 1971 when one of my elder cousins brought one- mechanical winding with a long chain - from overseas. Since then I had a fancy for the beauty of it. When I got a chance to visit the place recently where cuckoo clock originated, it was a dream come true as I could be . 'One who flew over the cuckoos nest........' courtesy to Jack Nicholson starred 1975 Hollywood blockbuster but only intended for a name!! Cuckoo clocks are traditionally wall mounted ones with a moving pendulum.Every hour as the clock strikes, a trap door is opened and a cuckoo emerges out and announces it with its distinctive call.Mostly in the antique types this is followed by playful western different melodies. And at times again this is followed by movements of mechanical figures in a vibrant village life including a wife beating her husband with a fry pan ! I don't know whether this is a common natural scene in Black Forest Highlands but we Indians are lucky since most of our women don't beat husbands but accomplishes better results by oral nagging!! The demonstration room of the manufacturer has well kept the work table in the traditional way to show the visitors how it was made earlier. Cuckoo clocks are made from the wood of Linden tree, also known as Lime tree which is native to north of Alps. Traditionally such clocks were made earlier during winter months when the farms in the Black Forest area were fully covered with snow. People made finely detailed hand carved cases that housed the cuckoo.I was told that the music box used in the clocks are seldom made in Germany but in Switzerland. I have been harping on the point that Indian tourists have started travelling around the world in good number for the last two years or so. At the entrance of the cuckoo clock factory located in deep of Black Forest Highlands, a cluster of directive boards invited my attention. Definitely it must be the places(countries) from where most of the visitors come to their joint. Along with New York, London, Sydney ...few new generation places like Shanghai, Cape Town, Rio De Janeiro and Mumbai are placed as below !! A welcome change indeed!!! Black Forest cake is not directly named or became famous in the world because of the mountain range. But it is from the liquor of that region which is distilled from the tart cherries grown all over the place.This ingredient with its distinctive flavour makes the cakes famous!! I did not know this. PS: All photos/video are taken by me except the first one . For the same reason please excuse me for the quality ! Courtesy to Kuckusnest,Germany for the demonstration and German Tourist dept for the first photo.